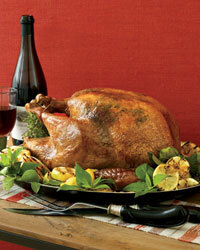 Food & Wine offers the best lessons on how to cook turkey for Thanksgiving. Here are spectacular spice rubs, brines, glazes and marinades; plus tips on how to deep-fry your bird. Grace Parisi blends garlic and sage into a butter that she rubs all over the turkey. This recipe is foolproof as long as you start with a good antibiotic-free bird that hasn't been plumped up with a water solution, like many inexpensive supermarket turkeys. Michael Symon salts his bird well and refrigerates it overnight to season it. Before roasting, he covers the breast and legs with cheesecloth that’s been soaked in a cider-infused butter. For his beer-spiked gravy, Symon recommends the German-style Dortmunder Gold, made by Great Lakes Brewing Company. Chef Joanne Chang marinates and bastes the bird with soy, sesame, honey and ginger, giving it superb flavor and a beautiful mahogany color. Soaking a turkey overnight in salted water produces an especially moist and well-flavored bird. Careful attention to basting, especially during the last hour of roasting, is also essential. 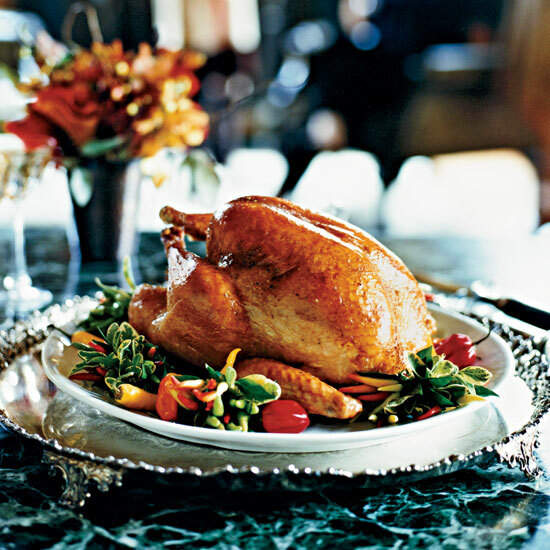 Chef Jose Garces’s smoked turkey recipe starts with an herb, spice and citrus-infused brine. Juniper berries, mustard seeds and caraway seeds flavor the brine for this Alsatian-inspired roast turkey. Riesling adds depth and complexity to the accompanying gravy. This simple, salt-based sage, pepper and paprika turkey rub produces a bird with crisp, golden-brown skin and incredibly moist and tender breast meat. After rubbing the bird with a bold and delicious mix of chile powder, cumin, sugar and herbs, Texas chef Tim Love blankets it with slices of salty, fatty pancetta, resulting in a supermoist and savory roast turkey. This Mexican-inspired wet rub, made from traditional mole spices including cinnamon, cocoa and chile-powder, flavors the turkey and produces a wonderful aroma as the bird roasts. Deep-frying a turkey isn’t as hard as it sounds (though it does require caution). And there’s a great payoff: an exquisitely moist, crispy bird. Here, Food & Wine’s deep fried turkey tips for a glistening bird with golden-brown skin.